The ice runway at Alton Bay on Lake Winnipesauke has a variable season. In 2010, excellent ice conditions combined with great flying weather. Approximately 750 aircraft used the facility and hundreds of pilots had the opportunity to add a landing at the ice runway to their logbooks. Alton Bay also has a Seaplane Base. Visit the ice runway in winter or the seaplane base in the summer. Nathaniel Hawthorne College in Antrim opened in 1962. In 1971 an aviation curriculum was added. In 1982, with the arrival of a new college president, the focus of the school was shifted to aeronautics and computer science. Unfortunately, the school closed in 1988. The Maharishi Vedic School used the buildings for a number of years before becoming the Maharishi Academy of Total Knowledge. Check out the airport facilities. What has happened to the facilities since the college closed? Research some of the Hawthorne College graduates. What are they doing now? Want to watch a range of aeronautic air sports? There is a hang-gliding and paragliding flight center on the New Hampshire side of the Connecticut River near Mt. Ascutney. The Morningside Airstrip includes a grass strip 2400' runway used for aero towing, tandem and single engine aviation. It is a full service training operation with transportation to launch sites. Are you up for trying one of these air sports? If not, no worry, they’re fun to watch. The McAuliffe-Shepard Discovery Center is a place to enjoy aviation, astronomy, space and rocketry activities. 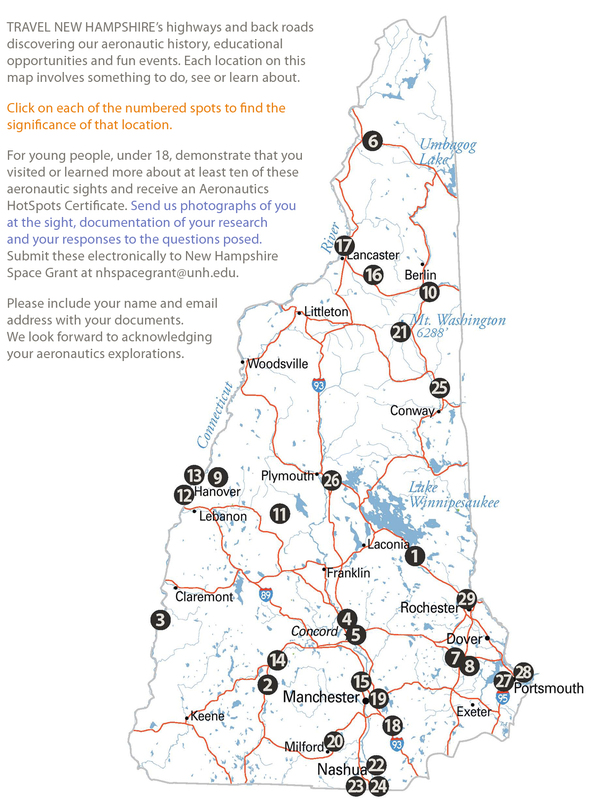 In addition to the Center's exhibits and programs, it is home to New Hampshire's NASA Educator Resource Center (ERC). Educators of all grade levels and homeschool parents can access NASA educational materials including educator briefs and guides, lithographs, posters, videos, slide sets and more. You can also tune into their radio show every third Thursday of the month at 1 PM on WKXL 1450 or online at www.wkxl1450.com. Note: On July 25, 1927 Charles Lindbergh landed at Concord in the Spirit of St. Louis on his U.S. tour. Concord is home to New Hampshire’s first airport built in 1920. Visit the Concord airport and see if there is anything there commemorating Charles Lindbergh’s visit. The Balsams Grand Resort Hotel was the first corporate aircraft owner in 1923 flying three Curtis Orioles from Garden City to Dixville Notch delivering fresh fish, cut flowers and newspapers in time for breakfast. If you’re ever in the neighborhood, ask if they still fly in supplies for the Grand Resort. If so, what? June 9, 1943 nineteen women aeronautical engineers were pursuing their training at the University of New Hampshire aided by fellowships from the Pratt and Whitney division of United Aircraft Corporation of East Hartford, Connecticut. Because of the shortage of male engineers during W.W.II, Pratt & Whitney Aircraft Corporation established Engineering-Aide programs at several Universities including UNH. One of the "P&W Girls" describes her experience in the program in a UNH publication: "Our academic courses were all prescribed by Pratt & Whitney. However, most of the courses were the same as the Mechanical Engineering program at UNH. We did not take our courses with the men, but we had the same professors and we used the same facilities in the engineering school. That meant we became the first women to ever set foot in the engineering laboratories. We found them to be very dingy and dirty. As soon as possible we set to work to clean up the area. This did not make us popular with the men who also used these facilities. Perhaps they also disliked having the competition, for the P&W Girls turned out to be excellent students." The entry of women into defense jobs is well known through “Rosie the Riveter,” but those in wartime engineering and related work are not often recognized; however, thousands entered professional work after being prepared through this program. In mid-1940, before America had officially entered World War II, it was brought to the attention of the U.S. Congress that the civilian effort supporting the expected conflict would require far more engineers than were then available or could be produced through normal programs at colleges and universities. Congress tasked the Commissioner of Education to develop a program to help alleviate this crisis. The bill authorized the Office of Education to contract with engineering schools throughout the U.S. to offer “intensive courses of college grade, designed to meet the shortage of engineers in activities essential to national defense”. In July 1941, Dean George W. Case, from the University of New Hampshire became the program director. 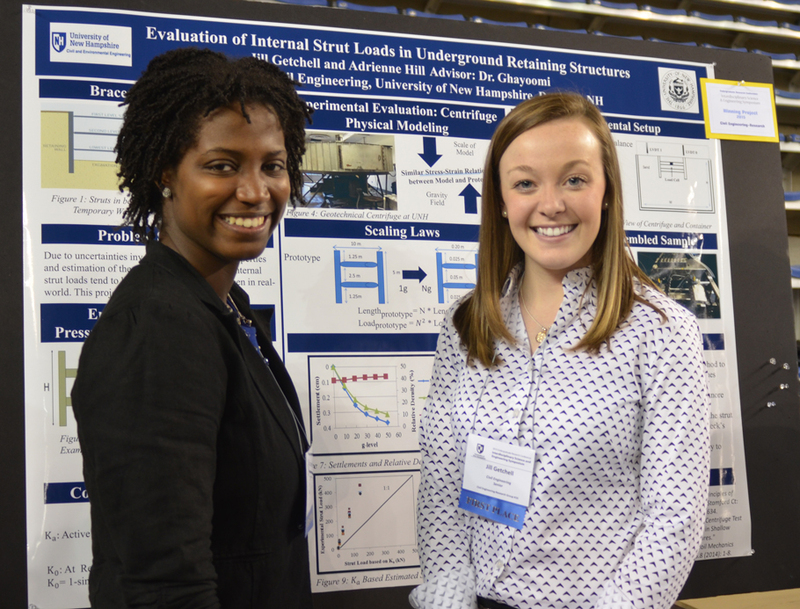 How many women engineering undergraduates are there at UNH today? Visit the UNH engineering facilities and talk to one of the women students about her experience. Is it similar to that of the “P&W Girls”? UNH students design, build and compete with a remote controlled airplane in the annual competition sponsored by the SAE (Society of Automotive Engineers). The aircraft needs to lift as much weight as possible and accurately predicting the lifting capacity of the aircraft is an important part of the competition. The first UNH Aero Team was formed in academic year 2007-2008. Find out if there is a UNH Aero Team this year. If so, ask if there are any opportunities to observe their remote controlled airplane? Talk to a team member who developed the airplane to learn more about their design. Mary L. "Babs" Nutt had already enjoyed an adventurous life when she took up soaring in 1970. After college, she moved to New Hampshire with her husband, David. The two spent several summers in the Arctic aboard the research schooner Blue Dolphin, where Babs served as radio operator and crew. When her children were grown, Babs took up flying. She started in powered aircraft, but decided that soaring was the sport for her. She quickly became enamored with wave soaring which she practiced whenever she could in the mountains of Vermont and New Hampshire. In March of 1975, she and Hannah Duncan set the current World Feminine Multiplace altitude record of 35,463 feet, flying out of Black Forest Gliderport in Colorado. Can you find anything in Etna commemorating Mary Nutt or her soaring record? The Mt. Washington area in northern New Hampshire is famous for wave flying. In 1938, Lewin Barringer made the first U.S. wave flight in this area, and there have been many gold and diamond climbs since then. Over the years, glider pilots have flown in the Mt. Washington wave from several sites including Glen and North Conway in New Hampshire and Fryeburg, Maine. Currently, the best is Gorham, New Hampshire. Note: Mt. Washington is not a lone peak but in fact the highest point on an impressive mountain ridge known as the Presidential Range that includes numerous peaks, many named after U.S. Presidents. From south to north these include Monroe (5374'), Washington (6288'), Jefferson (5712'), Adams (5774') and Madison (5367'). It's important to think of this as a ridge, and to understand the effect this has on glider flying in this area. The next time you’re around the Presidential Range look for a wave flier. Seek out a glider pilot and ask him/her about the intricacies of flying near Mt. Washington. Beryllium, next to lithium, is the lightest metal, only 1.84 times as heavy as water. Research into means of producing it less expensively were spurred by aviation's need for light, strong metals in the 1930’s. The ore is plentiful in New Hampshire. Minerals such as Mica, Feldspar, Beryl, and Uranium were mined at Ruggles, near Grafton, for 175 years. Beryl is the principal ore of the metal known as beryllium. Beryllium is lighter than aluminum and stronger than steel. Today, beryllium alloys are used in atomic reactors, electrical components, and as metal on spaceship components used at NASA. At one time during the mining of beryl at Ruggles Mine, a mass of the mineral was discovered that filled three freight train cars. In 1963 the Ruggles Mine was opened to the public. For 40 years visitors have been able to come and experience a part of geologic and mining history. When entering the mine today one can still see where the feldspar and mica of the pegmatite connects to schist of the Littleton formation and the layers of schist that stand vertically above the pegmatite. The collecting of minerals is permitted at the Ruggles Mine. Explore the enormous caverns and tunnels. Go collecting. Ruggles Mine is open weekends May to June and daily from June through October. Lee Kreindler, a pioneer in international aviation accident law, graduated from Dartmouth College. The year after he joined his father’s law firm, the crash of a DC-6 into the yard of an orphanage in Elizabeth, New Jersey, led to his first aviation accident suit. Kreindler's dogged investigation into that case, which included work in a LaGuardia Airport propeller shop to understand aeronautics, launched a career in which he became widely acknowledged as a pioneer in aviation accident litigation. He authored the preeminent book on the subject, Aviation Accident Law, and served as the lead plaintiffs' lawyer in numerous high-profile air-crash cases. The Kreindler Foundation supported an academic facility at Dartmouth College. The Lee S. Kreindler Conference Center is a suite of rooms including a tiered classroom, seminar room and multimedia room in the Haldeman Center. The Lee S. Kreindler Foundation was created to further Kreindler's work and his devotion to employing the civil justice system to help those devastated by international tragedies. Dartmouth’s Student Branch of the American Institute of Aeronautics and Astronautics was created to provide a place for undergraduates to pursue their love for science and engineering. The branch has two major projects: (1) establishing itself as a supporter of undergraduate research, and (2) helping share their members' passion through local outreach programs. Visit the Kreindler Conference Center. 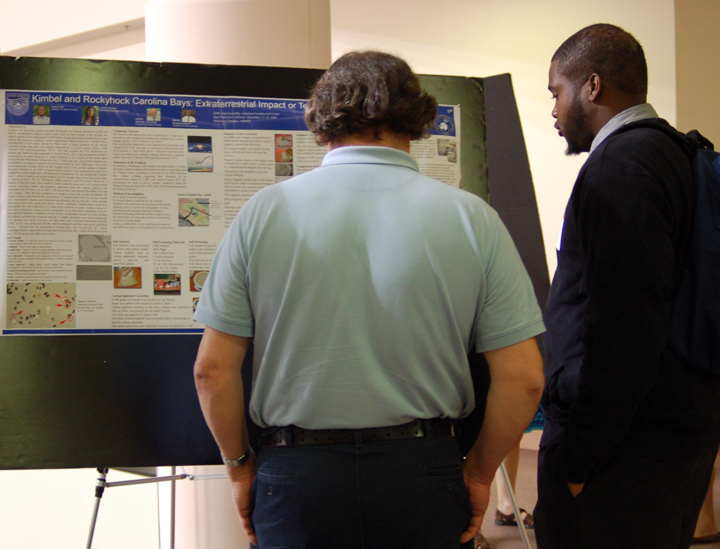 Ask a student member of the AIAA about outreach programs that you might attend. The Cold Regions Research and Engineering Laboratory (CRREL) is a United States Army Corps of Engineers research facility specializing in scientific and engineering research regarding cold regions of the world. Its primary mission is to enhance the military's ability to operate in cold environments, but it also works on many non-military projects. CRREL’s research has included a range of aeronautically related investigations, including an investigation on remote-sensing systems that map aircraft icing conditions in the flight path from airports. An icing remote-sensing system requires consideration of the operational environment, the meteorological environment, and the technology available. What other research is Cold Regions Research and Engineering Lab doing related to aeronautics? Contact one of their researchers and ask them about their career. The Hillsboro Balloon Festival organized by the Granite State Balloon Association has become a major four-day event. In addition to the original events and entertainment, each year new attractions are added. The thrill of the weekend is the Hot Air Balloons piloted and crewed by regional balloon enthusiasts. Balloon flights over New Hampshire's beautiful Monadnock Region are available to the general public along with tethered flights for the more cautious. The Granite State Balloon Association is a group of pilots, crew, and families dedicated to making ballooning a safe, fun sport in New Hampshire. Take a ride in a balloon at the festival. While you’re in Hillsborough, if you are looking for old aviation books or model rocket kits check out C.A. Hood. They stock thousands of aviation books including a huge selection of out of print aviation magazines, books, profiles & modeling reference materials. They also have rare, out of production and current models and stock an ever-changing selection of older models. GE Aviation assembles jet engines for the Unites States Department of Defense and commercial operators. Crucial parts for these engines are crafted in secondary GEAE facilities such as the one in Hooksett where engine blades and vanes are manufactured. What else is made at the GE Aviation plant in Hooksett? Talk to someone that works there about their job. Thaddeus Lowe, also known as Professor T. S. C. Lowe, was an American Civil War aeronaut, scientist and inventor. He was born in 1832 in Jefferson Mills and was mostly self-educated in the fields of chemistry, meteorology, and aeronautics. With the onset of the American Civil War, Lowe offered his services as an aeronaut for the purposes of performing aerial reconnaissance on the Confederate troops on behalf of the Union Army. Lowe's first outing was performed at First Bull Run. His performance was impressive though he had the misfortune of having to land behind enemy lines. Fortunately members of the 31st New York Volunteers found him before the enemy could discover him, but after the landing he had twisted his ankle and was not able to walk out with them. They returned to Fort Corcoran to report his position. Eventually his wife, disguised as an old hag, came to his rescue with a buckboard and canvas covers and was able to extract him and his equipment safely. In July 1861 Lowe was appointed Chief Aeronaut of the Union Army Balloon Corps by President Abraham Lincoln. Learn more about aeronauts in the Civil War. The Aviation Association of New Hampshire, the State's oldest Pilot Association, was founded in Lancaster in 1957. The Association is a sponsor the New England Aviation Expo and stages their annual Fly-In at the strip in Alton. Where is the office of the AANH today? Attend one of their programs. The New Hampshire Aviation Museum is located at 13 East Perimeter Road in Londonderry, NH. It is housed in Manchester Airport's historic 1937 terminal building and is open Friday, Saturday and Sunday. Museum exhibits cover persons, places, events and artifacts related to the aviation history of New Hampshire. There are no full size aircraft on exhibit at this time. The Museum does present live programs covering aeronautical history and aviation related science and publishes a monthly newsletter. Visit the museum. Attend a program. Sign up for their newsletter. (Excerpts from Grenier Army Air Field in WWII by Tom Hildreth and the NH Aviation Museum’s timeline.) Some would suggest the history of aviation in New Hampshire began with the first balloon ascension over Manchester. In the 1850’s balloonist Eugene Goddard ascended over Manchester on the back of a horse. But it was the success of Charles A. Lindbergh in crossing the Atlantic Ocean in his single-engine "Spirit of St. Louis" in 1927 that truly sparked great interest in aviation. Manchester, like most American cities, embraced the aviation phenomenon with enthusiasm. On August 25 of that year, a loan was approved to establish an airport in the Queen City. Construction of two 1800-ft. runways began on October 25, at what became known as Smith Field. In 1933	Amelia Earhart landed here. The airport saw gradual improvement during the 1930s, including construction of a hangar and administration building. During this time the runways were paved with asphalt. A Civilian Pilot Training program was begun in 1939 under the auspices of the Civil Aeronautics Administration. This led to a tremendous increase in flying activity at Smith Field. On October 3, 1940, the War Department announced that the Manchester Airport would be developed as the Manchester Army Air Base (later renamed Grenier Army Air Field). Expansion efforts began immediately. The Works Project Administration (WPA) broke ground in October. During December, work began around the clock on the strengthening and expansion of the airfield's runway and tarmac areas. The rapid construction of the base was a remarkable feat. By June the empty field had been transformed into an airbase capable of housing more than 2,000 people. During a crucial part of World War II, this airport was the primary staging base for heavy bombers en route to the war in Germany. The hospital, occupying fifteen different buildings, was designated as an Air Evacuation Center for war casualties returning from combat in Europe. Training of combat aircrew required access to a practice bomb range, and in 1941 the government acquired a plot of land near Joe English Mountain in New Boston, New Hampshire. German submarines had begun to take their toll on Allied shipping, and Manchester-based aircraft armed with depth bombs participated in the search for the U-boats. The 13th Anti-Submarine Squadron began operating from Grenier during the summer of 1942 with bombers and a number of Lockheed aircraft. An uncertain future lay ahead for many of the nation's wartime facilities after the war. Beginning as early as 1943, military leaders had discussed the need for the formation of National Guard and Reserve flying units following the termination of hostilities. Manchester eventually became home to units of the Air National Guard and Air Force Reserve until 1966. The sharp-eyed traveler today can still catch a glimpse of the airport's wartime history. A group of wooden two-story barracks exists in the southwest corner of the property, not far from the UPS and Fedex facilities. Located among the tall pines in this area, these remnants of Grenier Army Air Field house a number of small businesses. Can you find remnants of Grenier Army Air Field? Aviation history buffs will quickly recognize the name Alberto Santos-Dumont as Europe's premier aviator when they drive by the Santos Dumont Coffee and Ice Cream Parlor. In 1906 Dumont achieved Europe's first manned, powered, and controlled flight. He is recognized as one of the great pioneers of aviation with an array of recognizable aircraft. Fewer may realize that he funded his endeavors through his thriving coffee bean trade. This sets the stage for a wonderful little cafe on the Milford/Wilton town line off highway 101. Unfortunately the Santos-Dumont Coffee Shop has closed. Does anyone know what happened to the large-scale model of the famous Antoinette aircraft that used to hang from the ceiling along with the assorted period posters, photos, and books covering the early days of European aviation? Find a model of the Santos-Dumont aircraft on-line. Mount Washington Observatory has been the sight of many research projects including the Mt. Washington Icing Sensor Project. The purpose of the project, funded by NASA and the FAA, was to evaluate remote sensing technologies for determining icing conditions ahead of aircraft for avoidance and escape. These instruments, provided by the Army Cold Regions Research and Engineering Laboratory (CRREL) of Hanover, NH, and others, provided "gound truth" information about cloud liquid water and drop sizes sensed by radars, radiometers and a lidar located at the cog railway base station. Visit the Mt. Washington Observatory and ask if there are other connections to aeronautics and the Observatory or the mountain. What is ‘ground truth’? BAE Systems is an international company engaged in the development of advanced aerospace systems. BAE Systems of North America products include aeronautics, navigation, reconnaissance and surveillance, space electronics, combat systems, hybrid power supplies, automation and robotics. The Nashua facility focuses on Electronics and Integrated Systems including communication, navigation, identification and reconnaissance systems for the Air Force’s Raptor. What other aerospace products does BAE Systems produce? What types of jobs are there at the Nashua facility? Nashua Community College, or NCC, part of the Community College System of New Hampshire, offers an Associate in Science Degree in Aviation Technology. This program is for men and women interested in professional careers in aviation maintenance. Graduates are employed with airlines, fixed base operators or aircraft manufacturers. The NCC is an FAA approved training facility. The program places major emphasis on the study of actual aircraft, structures, and powerplants. Visit Nashua Community College campus and learn more about the Aviation Technology program and their facilities. Daniel Webster College was founded in the year 1965. This college is situated in Nashua, New Hampshire and was first established as the New England Aeronautical Institute. Today it is the only accredited undergraduate pilot training program in New England. Although the pilot training program is being phased out, the Air Traffic Control and Aviation Management programs will continue. Their programs prepare students for a range of roles in air transportation, airports and facilities, and fixed-based operations. Daniel Webster College hosted the New England Aviation Expo along with AANH for many years. Keep your eyes out for future plans for the Expo. Talk to a Daniel Webster College student. Ask them what attracted them to aviation and what do they plan to do with their degree? Learn more about their Air Traffic Control program. Try out this activity in the Discovery Center Weather Arcade at the Weather Discovery Center: Whenever you fly in a plane, or stick your hand out of a car window, you are demonstrating "Bernoulli's Principle." Daniel Bernoulli was a Swiss scientist who found that the speed of flow in air or fluids determines the pressure. So, when you have a curved object such as an airplane's wing, the air rushes faster over the top of the wing, which drops the air pressure. Lower pressure allows the wing to "lift" up, causing the wing, and the plane to which it is attached, to rise. This does not, of course, account for all of the lift. Otherwise, an airplane would never be able to fly upside down -- if only the curved surface were responsible for lift, flying an airplane with the curved surface underneath would pull the aircraft downwards, and that doesn't occur. And if you've ever made a paper airplane without curving the wings, it will still fly a significant distance. The Bernoulli effect accounts for some lift, but speed and angle of attack are much more important in achieving winged flight. The effect is also important in the weather, especially for mountainous regions, like Mount Washington in New Hampshire. As the wind hits the mountain, it gets forced upward, which increases its speed (again, lowering the pressure). This is called "orographic" lifting, which means that the mountains cause the lift. The shape and location of Mount Washington make it ideal for orographic lifting, and are partly responsible for the unique and incredible winds seen on the summit. In 1934, a record of 231 mph was recorded! What did you learn from this activity? Think of another way of teaching others about this principle. Is 231 mph still the world land record for wind speed? 26. Plymouth – What can I do with a major in Geography and Geographic Technology? Geographers utilize a variety of technologies to generate maps, store, analyze and interpret map information. Plymouth State University offers Geography specializations in Cartography, Geographic Information Systems and Remote Sensing. 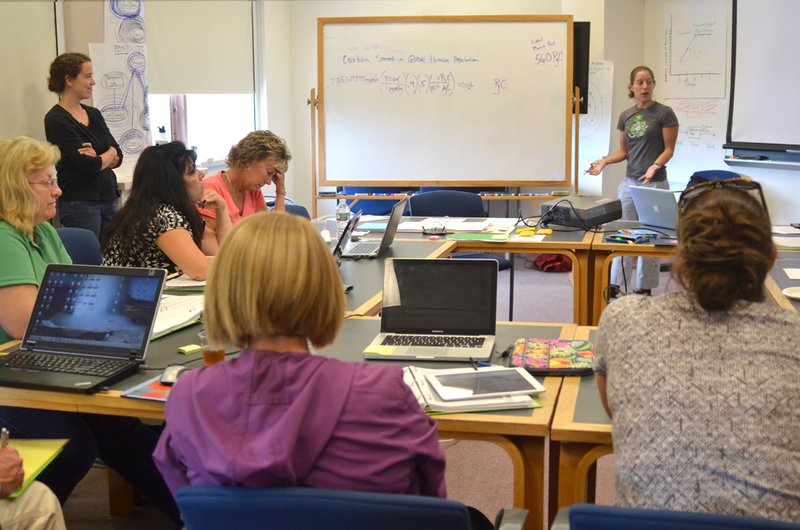 Students gain experience reading maps and interpreting data sources including geological surveys and satellite images. Graduates find jobs in federal government agencies such as the National Aeronautics and Space Administration and Department of Defense, in state and regional government agencies such as Departments of Transportation, and in private industry. Visit Plymouth State University and learn more about their Geography and Geographic Technology courses and facilities. Meteorology is an important component of safe aeronautics! Meteorologists provide forecasts for take-off, in-route, and landing weather via human- and computer-generated forecast data. One of the most important factors for an accurate forecast is knowing what the weather currently is. Meteorologists use observations from surface-based and balloon borne sensors, radars, and satellites to put the current picture together. The meteorology program at Plymouth State University (PSU) provides students with education and training on these observational systems and also through the various techniques used in weather prediction. PSU faculty and students have been involved in major aircraft icing studies with NASA, Federal Aviation Administration, Mount Washington Observatory, the U. S. Army’s Cold Regions Research and Engineering Laboratory, the National Center for Atmospheric Research. They have also contributed to several major air quality studies involving the NASA, National Oceanographic and Atmospheric Administration and the University of New Hampshire. They have worked on more regional aeronautical projects, such as the impact of sea breezes on Logan airport operations, and have provided training to pilots from the NH Civil Air Patrol on mountain meteorology. Visit Plymouth State University and learn more about their meteorology program and check out their outstanding technological facilities in the Judd Gregg Meteorology Institute section of the Boyd Science Center. The Portsmouth Municipal Airport had played only a small role in the Granite State's development. Airline passenger service was inaugurated on the Boston-Bangor Civil Airway in 1933, with Portsmouth designated as an auxiliary landing field on the route. During part of World War II, the airfield came under Army Air Force jurisdiction, but was not used as a military airbase. During the 1950s, the U.S. Air Force grew from a fledgling branch of the military to a global force. The backdrop of this growth was the arms race. The Air Force's Stratojet program produced more than 2,100 of the medium jet bombers, and SAC officials looked hard to find real estate from which to operate this burgeoning fleet. Nearness to Europe and the North Atlantic air routes made New England a prime choice for new base construction. On October 7, 1954, the Air Force opened a liaison office in the Portsmouth area. Their sights were set on a large, sparsely populated tract of land situated between Great Bay to the west, the Piscataqua River to the north, and Portsmouth to the east. This acreage was easily reached by rail, highway and water. In December 1954 the initial phase of base construction began. Land clearing and construction gained momentum with base activation early in 1956. The 100th Bomb Wing (BW) was activated at Portsmouth AFB. Then the 100th Air Refueling Squadron (ARS), which operated 18 tankers, was assigned to the 100th BW. Construction of a badly needed 1,100-unit housing project was begun in 1957. The importance of these and other expansions to Pease AFB became obvious on July 1, 1958, when the 509th BW arrived on permanent assignment from Roswell, New Mexico. The 100th Bomb Wing operated from Pease AFB for ten years. They performed global strategic bombardment training and air refueling missions. On April 1, 1991, after 36 years as a bomber base, Pease was closed as an active Air Force installation. Most of the apron at what is now called Pease International Tradeport is empty. Other than the immense size of the place, today's activities offer little clue to the operational tempo of the base during the Stratojet years. On your visit to Pease International Tradeport, follow the signs to the Wildlife Refuge until you reach a left hand turn for Short Street. Drive up to the parking area on Short Street for an expansive view of the runway and any planes landing. Find the monument honoring POW-MIA pilots and read the poem in their memory. Check out the exhibit “Weapons to Wildlife” at the Great Bay National Wildlife Refuge kiosk. New research on horseshoe crabs is taking to the friendly skies over Great Bay. To survey pits dug by horseshoe crabs in the sediments of the Great Bay Estuary, researchers attached a small camera onto a model airplane. The research is focused on sediment disturbance created by foraging horseshoe crabs and the impacts of that disturbance on the invertebrate community. To this end, video data collected from the model airplane flyovers determines the extent and location of the disturbance in the bay. What other ways can remote control airplanes can be used for research? Professor T. H. Flowers of Boston, famous for his aerial balloon programs, appeared many years from the 1800’s into the 1930’s. The hot air balloon ascensions and parachute drops took place in early afternoon of each day and people all over the city looked skyward. The Wright Brother's "flying machine" landed in center field of the Rochester Field in 1910 for a four-day visit. It was billed as the greatest drawing feature ever brought to Rochester. In 1911, the famous pilot Charles K. Hamilton, who did three shows a day, brought a Curtis bi-plane to the Fair. Miss Ruth Bancroft Law, pioneering aviatrix of the early 1900’s, made daily flights at the Fair as well. In the '20's and '30's, five or six barnstormers would dog fight above the fairgrounds then land on the racetrack's infield to take paying passengers for a ride. The planes were small enough and light enough to land and take off in that short of a makeshift runway. Do they have anything related to aeronautics at the fair now? Looking for more NH Road trips? NHSGC endeavors to provide information that is accurate and up-to-date for the HotSpots Road Trips. However, NHSGC makes no representation or warranty about this information. In no event shall NHSGC be liable for any damages resulting from reliance on the information contained in this document and the associated web site. We invite users to submit updated information to us in support of other users.